KIEV, Ukraine -- The most effective thing Russian President Vladimir Putin did to destabilize Ukraine was the one thing the West was demanding: He leaned on pro-Russian separatists in the country's east to cease fire. Left without the much-used cover of a war, the internal divisions and dysfunctional core of the Ukrainian political elite didn't take long to reveal itself. 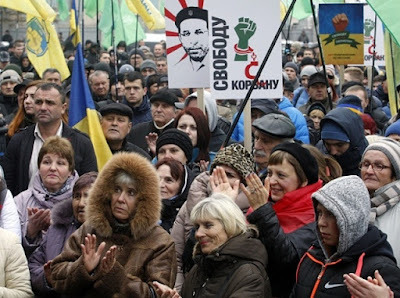 Rather than the democratic hope it might have become after last year's "Revolution of Dignity," Ukraine now looks like just another incompetent and corrupt post-Soviet regime. It's no wonder cracks are appearing in Kiev's all-important relationship with the West. The government is in turmoil: Prime Minister Arseniy Yatsenyuk is in danger of being fired as soon as that becomes legally possible in December, threatening the fragile ruling coalition, in which Yatsenyuk's party is the second strongest force. If the coalition falls apart -- a likely outcome if Yatsenyuk is forced to resign -- there will be an early parliamentary election. Pro-European Ukrainians might actually be relieved at that. Populists dominate the legislature, which would have made it difficult to push through meaningful reform -- if anyone were trying. On Thursday, the parliament rejected a bill specifically banning workplace discrimination against homosexuals. Despite attempts at change by a new generation of bureaucrats, Ukraine's economy remains unreformed. Taxes are oppressive but widely evaded, the shadow economy is growing and the regulatory climate for business has barely improved. The International Monetary Fund, the country's biggest source of hard currency after a steep drop in exports, is optimistic about next year's economic growth prospects, forecasting a 2 percent expansion, but last month it revised this year's projection to an 11 percent decline. Ukraine's most popular politician -- not a Ukrainian but Mikheil Saakashvili, the former president of Georgia, appointed by Ukrainian President Petro Poroshenko to run the Odessa region -- has proposed a libertarian reform package, but Poroshenko hasn't given it his official backing and the current parliament is not likely to adopt it. Equally unreformed is Ukraine's incredibly corrupt justice system. In September, Christof Heyns, the United Nations special rapporteur on extrajudicial, summary or arbitrary executions, said after visiting Ukraine that the country lived in an "accountability vacuum." Heyns bemoaned the failure of the Ukrainian authorities to investigate the deaths of more than 100 people on the streets of Kiev in the final days of the revolution and of 48 pro-Russian protesters in a burning building in Odessa in May, 2014. Those investigations are stalled, and attempts by the victims' lawyers to speed them up have been stonewalled by authorities as some of the suspects in the Kiev shootings are still employed by the Interior Ministry. Heyns also said Ukraine's Security Service "seems to be above the law." Apart from raiding a number of tech companies in an apparent scare campaign in recent weeks, last weekend the service arrested Gennady Korban, a top lieutenant of oligarch Igor Kolomoisky, who has been resisting the consolidation of power by Poroshenko. The arrest gave rise to accusations of selective justice in the Ukrainian press. Other oligarchs, after all, face no reprisals -- perhaps because they've accepted Poroshenko's dominance. Two years after the corrupt team of President Viktor Yanukovych fled Ukraine, corruption is still rife and the country's intrepid investigative journalists have been especially busy again. Setting the tone is Poroshenko -- the only of the country's 10 richest people to see his net worth increase in the past year -- who seems to have forgotten his promise to sell off his businesses; his bank has only expanded as many others lost their licenses. Poroshenko's and Yatsenyuk's close allies are routinely named in connection with corrupt schemes involving Ukraine's customs service and state energy companies. The system of checks and balances that has been sold to the Americans isn't working. Instead of keeping an eye on each other, the Poroshenko and Yatsenyuk teams have made a deal. They have divided up spheres of influence and responsibility so they don't get in each other's way and come into conflict. Americans are highly visible in the Ukrainian political process. The U.S. embassy in Kiev is a center of power, and Ukrainian politicians openly talk of appointments and dismissals being vetted by U.S. Ambassador Geoffrey Pyatt and even U.S. Vice President Joe Biden. "Pyatt and the U.S. administration have more influence than ever in the history of independent Ukraine," Leschenko wrote. Europeans too are involved in shaping the way Ukraine is governed, not just because they are donors -- the U.S. is more important in that respect because of its influence on the IMF -- but because visa-free travel to Europe is one of Poroshenko's major goals. In his eyes, it would validate his efforts at making Ukraine more European and revive his flagging popularity. Europe's requirements for the visa-free regime center on Ukraine's seriousness in fighting corruption. The European Union recently refused a request for more funding for the anti-corruption prosecutor's office, because of "concerns raised with regard to some people who participate in the selection" of prosecutors for the office. This is a clear reference to the team of Prosecutor General Viktor Shokin, a Poroshenko appointee and long-time associate, who has been accused of undermining the anti-corruption efforts. On Thursday, European Commission President Jean-Claude Juncker wrote Poroshenko a letter saying that "progress in reforms in the area of the fight against corruption remains a key priority for achieving visa-free travel" and supplying a long list of reforms Ukraine would need to implement. All told, Ukraine's war on its past has been even less successful than its military efforts against Russia and its proxies. Too much time has passed since the "Revolution of Dignity" to justify the absence of tangible progress. The grip of oligarchs and a corrupt bureaucracy on what's left of the Ukrainian economy has proven too strong, the schemes too entrenched. Ukrainian civil society is stunted by these powerful vested interests. The local elections have proven that post-Soviet practices of fraud, bribery and intimidation have not been overcome. There's little will for further upheavals so soon after the revolution and the war in the east. But unless the current political elite finds it in itself to clean up -- a highly unlikely turn of events --Ukraine's history of violent regime change is probably not over yet.